Offers basic features including an IDX Home Search, Branded Site, and superior lead nurture with dynamic listing alerts, behavioral and auto-texting, and Facebook remarketing. Aside from all basic features, develop a strong connection with your clients with exclusive offers such as Lead Filtration, Digital Marketing Services, and Custom Ad Campaigns. while still getting one of the best deals in the market today. This is the hub of your buyer’s home search activity. It has a clean and beautiful site design that also ensures the fastest and most streamlined IDX experience. Ylopo provides an outstanding platform that automatically nurtures leads on your behalf across multiple channels. Represent your brand with a completely customizable and flexible website without paying additional fees for development or customization. For this plan, you only need to pay for a one-time setup fee of $1,000. There’s also a ** 10% marketing service fee applied on the monthly remarketing budget of up to $100. Make the most out of your budget while getting optimum results! Develop a stronger connection with your clients by getting access to Ylopo’s Full Tech Suite and our exclusive offers such as Lead Filtration, Digital Marketing Services, and Custom Ad Campaigns. 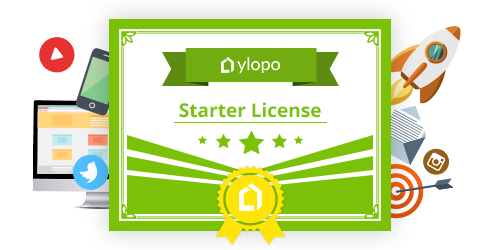 Letting Ylopo manage your digital marketing means you can either sign up for the Ylopo “Starter” license where you can generate 30-50 leads, or the Ylopo Complete Digital Marketing Solution (CDMS), where you can have 80+ leads. How many leads do you have in your database that you would like to nurture? Click here to see exactly how dynamic remarketing works! Please go to the top and choose a different level. engaged leads in your database each month with this investment! Would you like to stay relevant and in front of your sphere with dynamic remarketing? people in your sphere engaged each month with this investment! Your media spend lets you engage in your market more effectively to help you generate more high-quality leads, build your brand, and nurture your current database. This fee that comes with the Starter license gives you full access to the Ylopo Full Technology Suite and sophisticated digital marketing platforms. Need to know more of what Ylopo got in store for you? Click the button below!